Professor Martin Gill, Professor Steve Chapman & Dave Clark. Infologue.com was recently invited to the launch of the UK Outstanding Security Performance Awards (OSPAs). The OSPAs, which now boast representation in seven different countries, recognise and reward companies and individuals across the security sector. Events have previously been held in Australia, Norway and Germany, writes Ryan Gordon, News Desk at Infologue.com. The UK event, hosted at the renowned Savoy hotel in London, brought together numerous professionals from within the security industry. In his introduction to the event, Professor Martin Gill said: “It is with great enthusiasm that we talk about the UK OSPAs. These are going to take place in March next year. We’ve managed to get associations from around the country really enthusiastic about this. That’s what we’re doing in all countries. In all countries, we go to all the security associations and say “would you be prepared to support this initiative?” In that way we see it as different”. The event also provided an opportunity for the announcement of a new sponsorship link between the OPSAs and Edith Cowan University. The Western Australian based university is highly reputable and respected throughout Australia, and internationally. 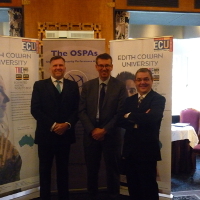 Professor Steve Chapman, Vice Chancellor of Edith Cowan University who was in attendance, said: “We are really proud to be associated with the OPSAs, I have been saying to Martin that we would like to become even more involved.. If you ever get the chance to look at ECU, or even visit us in beautiful Perth you’d find that there are some real gems, and one of the gems is security. We want to create an academy whereby if you’re thinking of security of any kind, it is ECU that pops up in your mind. One of the ways of being known globally is to be associated with the OPSAs, which are fantastic”. Professor Martin Gill & Professor Steve Chapman. Dave Clark, Chairman of The Security Commonwealth and ASIS UK, also provided some of his thoughts in relation to the OPSAs and The Security Commonwealth at the event. Dave said: “The Security Commonwealth is an independent organisation and we think we are well aligned with the OSPAs. We are about integrity, we are about collaboration, and we are about working together for greater aims in the security industry. The OSPAs are ideal for the Security Commonwealth to nail its colours to the mast of, and get behind”.